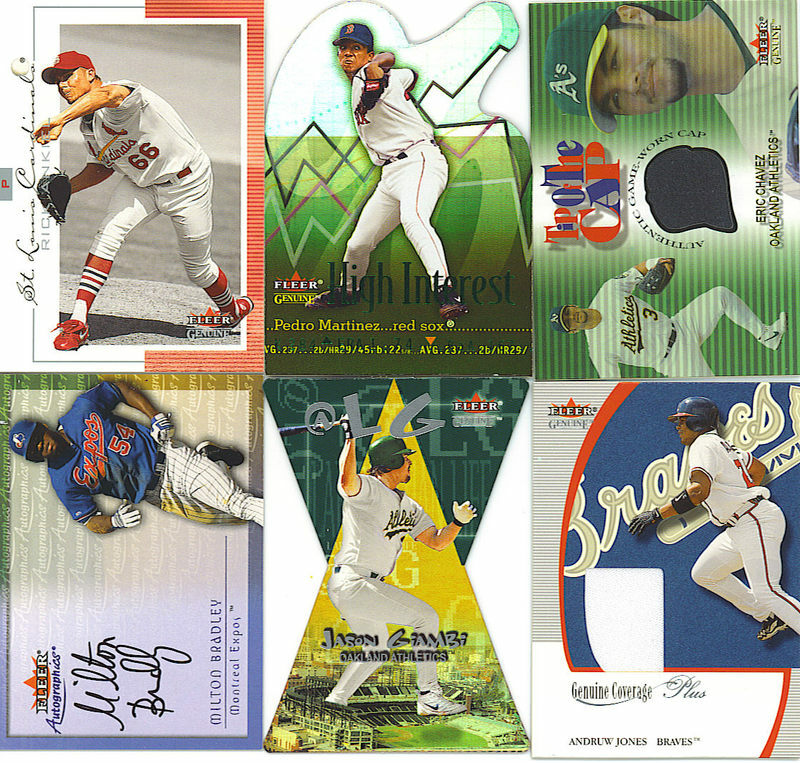 Here’s a quick recap, with scans, of the box of 2001 Fleer Genuine I recently busted. For a full review of this product, click here (broken 1.5 years ago). Base set: This box yielded 99 out of 100 short set base cards (99%) with 14 duplicates. The only missing base card was #14 Sammy Sosa. This is the second time I’ve pulled this card. The first copy I had was sent over to the UK. 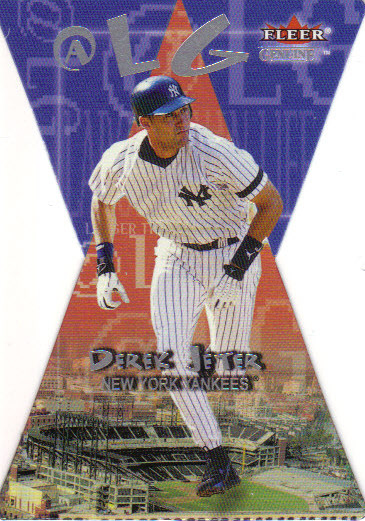 Here’s another prime example of a flashy and unique die-cut insert produced by Fleer in the early part of this decade. I was very surprised to pull two autographs. 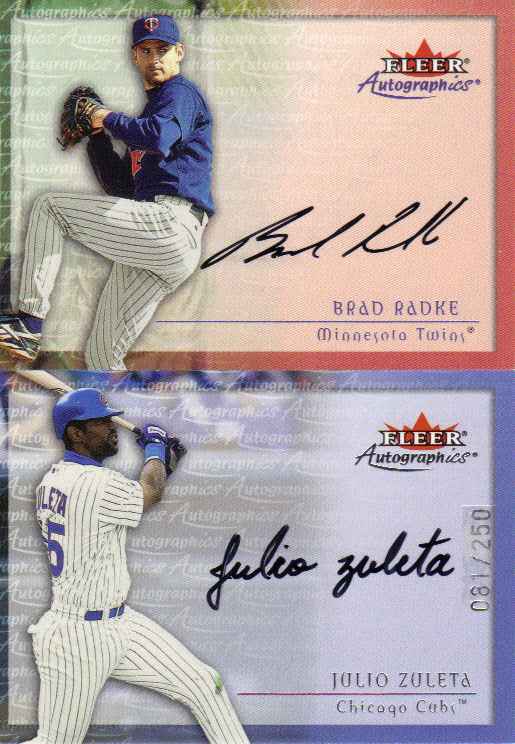 I know Radke had a pretty decent career with Minnesota, but I had no idea who Zuleta was until just now. Meh. The inserts and “hits” both delivered as promised (3 hits/box), but the lack of numbered rookies was a bit odd. There are no specified odds on these rookies, but considering my first box yielded two, it was a bit strange not pulling any this time around. Also, it would’ve been nice to put the base set together in this one box (rather than fall one short), but there were a LOT fewer base dupes here than in my first box! Everything from this box was exceptionally clean. Usually, I get at least one or two cards that I find totally mangled inside the pack, but not this time. It’s always great finding die-cut inserts that are unscathed as well. I loved finding the Maddux and Jeter cards. The others? Not so much. It was cool to pull two autographs, but it would’ve been even nicer to pull one that wasn’t considered a common. The Baseball Card Exchange has these listed for $70, by far the lowest price I’ve seen on the internet. Naturally, that is where I picked up my box. Most other places ask for around $100 or more. $70 for 3 “hits” (amongst several other inserts and virtually a complete base set) is not too shabby by any means, especially when cards like this are waiting to be pulled. Long story short, my box wasn’t anything special, but this product is still strong. Go try one. Here’s the first of what I hope will be a lengthly string of breaks. Again, I apologize for the lack of new material recently. The box in this break differs from the rest I’ve broken so far in that this product guaranteed “hits.” I’m not the biggest fan of chasing after “hits,” but I thought it’d be fun to mix it up once in a while. Coincidentally, this is the most recent box-to-date here, and comes from the year of Ichiromania 2001. Fleer Genuine was a product I never really understood. I mean, what was so Genuine about it? The fact that most of the time it was Genuine crap? Perhaps. 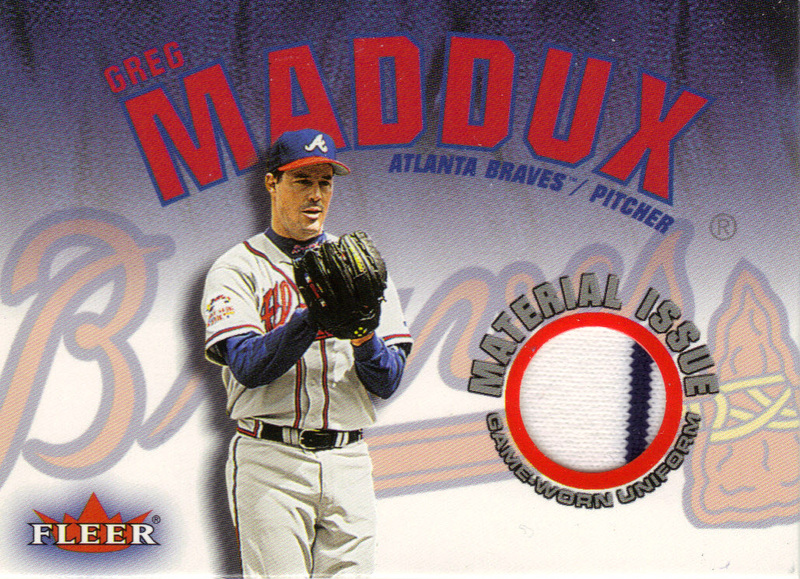 In its latter years, it “evolved” into Genuine Insider and featured cards where the jersey swatch or autograph was tucked inside the card and had to be pulled out to be displayed. 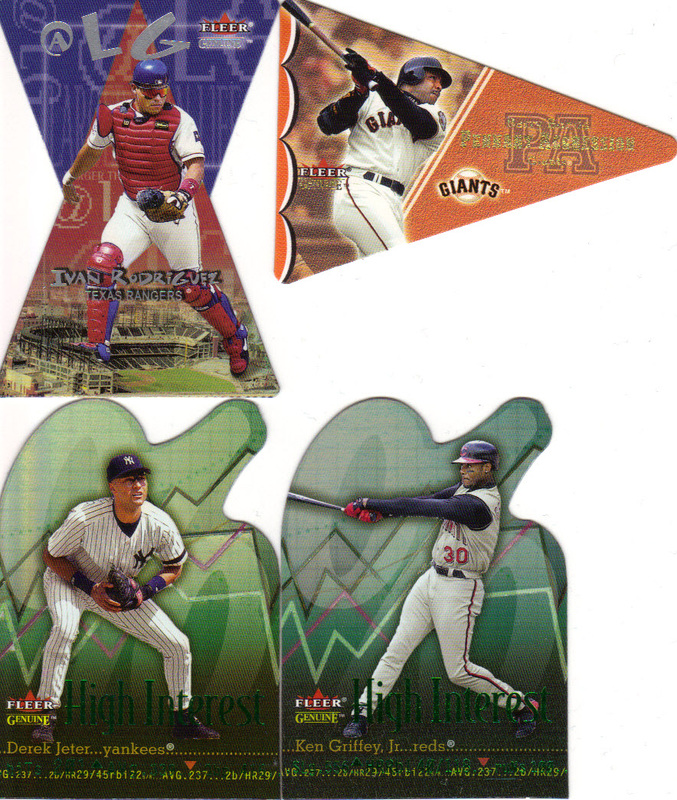 Of course, these cards were made when Fleer was just about a year away from dying so….draw your own conclusion. Despite some absurdities, there were 2 concepts used in Genuine that I had always been a fan of: the inclusion of past All-Star Game Programs as a boxtopper (this was used in 2002, the year of the worst ASG in history, THE IRONY!!!) and a legendary (IMO) game-used set entitled Names of the Game. Ladies and gentlemen: THAT is how you make a game-used set. Aside from Bucky Dent, the set is totally devoid of filler. Each card is limited to just 50 and 22 of them come with an autographed version, numbered to 100. They are all hand-numbered as well! Taking a shot at pulling one of these beauties may just well have been my motivation for opening this box of 2001 Fleer Genuine. There are 24 packs of 5 cards each, and “hits” come in every 8 packs so let’s see what was pulled…. Base set: There are 100 cards in the basic short set. Each card basically has a bunch of rectangles, one inside another, with a team-specific color theme making up a broken border on the outside. Each player’s name can be found scrolling upwards on the left side in a generic, silver font. Right above this is the team name, written in a thin point cursive style, that I suppose is intended to make the card look classy. Overall, my short set is 78% complete after this box, with 32 duplicates! Bleh. Genuine Upside (numbered to 1500): Following the short set is a 30-card rookie subset entitled Genuine Upside, limited to 1500. Basically, if you didn’t hit the Ichiro or Travis Hafner, you got nobodies. I got a pair of Red Sox players: Sun-Woo Kim and Juan Diaz. Hmm, what are the odds of hitting 2 rookies on the same team? High Interest (1:23 packs): All of the basic insert sets in this product have the same exact insertion ratio, 1:23. Also, they are all die-cut cards. 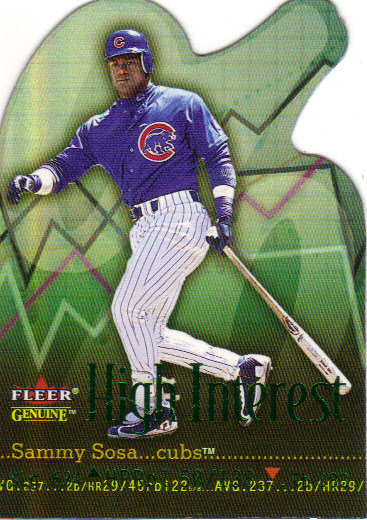 This first insert is called High Interest and features a stock market theme to it and a predominantly green background. My pull was of Pedro Martinez, another Red Sox player! At Large (1:23 packs): These cards have the same die-cut design as the Lasting Impressions cards from 1997 Pinnacle Certified. They feature the player seemingly standing over a stadium. Look out for that giant Giambi! 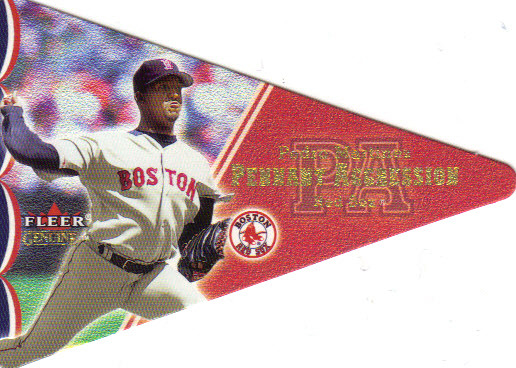 Pennant Aggression (1:23 packs): The final basic insert is entitled Pennant Agression. I’m pretty sure Fleer later used this in one of their Fall Classics sets or something of that nature. The card is shaped like a pennant and well…..um…..that’s basically it. Once again, I pulled Pedro Martinez. Seeing how Dave and Adam’s is located in NY, I’m starting to think they purposely sent me all the Red Sox cards. Ha! Autographics (1:24 packs): You may remember this set from my Fleer E-X and Fleer Focus breaks earlier. Well, in 2001, Autographics returned in a big way. In 2000, the set was spread across 5 different products. In 2001, the list expanded to 8 and a couple of those (Platinum and Genuine) included 2002 products! The complete list is as follows: Fleer Focus, Fleer Genuine, Fleer Premium RETAIL, Fleer Showcase RETAIL, Fleer Triple Crown, Fleer Ultra, 2002 Fleer Platinum, and 2002 Fleer Genuine. Of course, the odds differed from product to product. I was pretty much guaranteed to hit one in my box, and I did, of Milton Bradley, who has been tearing it up the first half of this season. There are also a couple of parallels to this set: Silver (/250) and Gold (/50). Genuine Coverage Plus (numbered to 150): These are a fairly tough pull, seeing as how they are limited to just 150 and there only 10 players in the set. These cards feature the team logo on a blue backdrop, and feature a little bigger swatch size than normal. My pull was Andruw Jones. It’s a pretty nice card for an underachiever (and by that I mean him, NOT me!). Tip Of the Cap (numbered to 150): Finally, the last insert/hit of the box, the game-used hat card. Like the Genuine Coverage cards, these are also numbered to 150. You don’t see too many hat cards out there, so at least it stands out a little. This card features 2 pictures of Eric Chavez, a close-up and an action shot, on opposite sides of the dark green hat swatch. There are only 13 total players in this set, so I imagine this wasn’t too easy a pull either. What WASN’T Pulled: Unfortunately, I didn’t hit any of the Names of the Game cards I spoke so highly of earlier. I also found it interesting that both of my game-used hits were of the uncommon variety and fairly low-numbered. Most boxes will yield a jersey card from the insert sets Final Cut and Material Issue, both of which are seeded 1:30 packs, but come with patch variations and have known shortprints. I also didn’t pull a redemption for a Jeter autographed sheet which expired ages ago. Final Thoughts: Like I said earlier, Fleer Genuine has had its share of terrible products and ridiculous ideas in the past, but I feel like the 2001 version (the premiere edition!) is not one of them. As far as the base set goes, the design is decent and there is one big rookie to shoot for (Albert Pujols was not in this set). The insert sets are designed well and there aren’t too many of them. 3 inserts, each seeded 1 per box, on top of your “hits” seems about right to me. I’m not crazy about seeing a meaningless 1:4 pack insert in every pack or seeing no inserts at all to go with the guaranteed “hits” when opening a box. With that said, you won’t see any late-1990’s Ultra or late-2000’s SP Authentic on here! Ok, well, I might give the Ultra a try someday. Anyway, the game-used cards also look very nice in this product for the most part and you’ll pull an autograph in every box, which is always nice. I don’t know if this product is notorious for bad collation, or if I just got unlucky when it came to attempting to finish the base set, but I don’t see any other downers to this product. For about $65, it’s worth a shot (unless you pull a ton of Red Sox like I did lol). As always, thanks for the read and good luck with your own breaks!